Foxglove (Digitalis Purpurea) other names: Dé de Bergère, Dead Man's Bells, Digitale, Digitale Laineuse, Digitale Pourpre, Digitale Pourprée, Digitalis lanata, Digitalis purpurea, Doigtier, Fairy Cap, Fairy Finger, Foxglove, Gant-de-Bergère, Gant-de-Notre-Dame, Gantelée, Gantière, Grande Digitale, Lady's Thimble, Lion's Mouth, Purple Foxglove, Scotch Mercury, Throatwort, Witch's Bells, Woolly Foxglove. The herbal plant known as the foxglove can reach six feet in height. 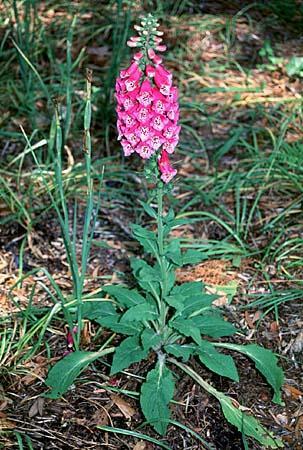 The foxglove has a straight stem without branches and grows as a biennial plant. During the spring bloom, foxglove flowers hang in bunches on the stem - the flowers of the foxglove have a dull pink or purple coloration, and often come with white spots on the corolla. The large sized leaves of the foxglove possess distinct and prominent veins running along the lamina. Among all the traditional medicinal plants of old, the foxglove is considered to be among the loveliest, the most significant, the best known and even the most lethal. The plant poison called digitalis is simply the powdered down dried leaves of the foxglove plant. Digitalis is a well known cardiac stimulating compound that has helped millions of heart patients stay alive due to its property of stimulating the cardiac muscles. Withering identified the foxglove as the curative herb from the old woman's mostly useless bag of weeds. The physician found that foxglove was capable of treating the swelling or edema, which accompanies congestive heart failure in a person. Withering would also find the poisonous nature of the foxglove herb and the real ability of the digitalis in the herb to completely stop the pulsation of the human heart, even while it was also capable of shocking the heart into contraction. The physician would spend a decade conducting precise experiments on the use of the foxglove to determine the proper dosage for this new herbal remedy. Withering would publish a paper on the properties of the foxglove herb in 1785, the record of his findings is considered a classic of medical literature and was referred by many physicians in his day. The shape of the blossoms give the herb its name, as the glove shaped flowers resembled gloved fingers and the name foxglove is an allusion to the white paws of the common red fox. While the foxglove has been mainly identified as a native English plant and associated with English countryside, the foxglove is found growing in many places throughout Europe and in the North American woods. The foxglove is a very easy to grow in most garden soils, particularly if such soils are rich in the content of organic matter and humus. The foxglove grows best in light dry soils in sites with a semi-shade; however, the foxglove can also succeeds very well in sites with full exposure to the sunlight if the soil at the site is also moist or wet. Foxglove is a plant. Although the parts of the foxglove that grow above the ground can be used for medicine, foxglove is unsafe for self-medication. All parts of the foxglove are poisonous. The foxglove was originally used by the Irish as healing herb in the folk medicine of Ireland to treat skin problems such as boils and ulcers, as well as headaches and paralysis. The main chemical compound found in the foxglove plant is a glycoside called digitoxin; this chemical compound has been chemically isolated in the laboratory and is now artificially synthesized as well. The compound is employed as a major medication, called digitalis, used in the treatment of congestive heart failure and to right congenital heart defects in patients. The contraction of cardiac muscles is strengthened and boosted by the digitoxin; the compound also slows the pulsation rate of the human heart. Foxglove also contains one more important glycoside called digoxin; this compound has a diuretic effect on the kidneys and is used in some medications. The reason for the traditional fear of the foxglove herb is that any of the chemicals found in the plant are extremely dangerous when ingested in high doses by humans or animals. The compounds in the foxglove can induce cardiac rhythm disorders, sudden depression, heart failure or asphyxiation if they are ingested in large quantities. 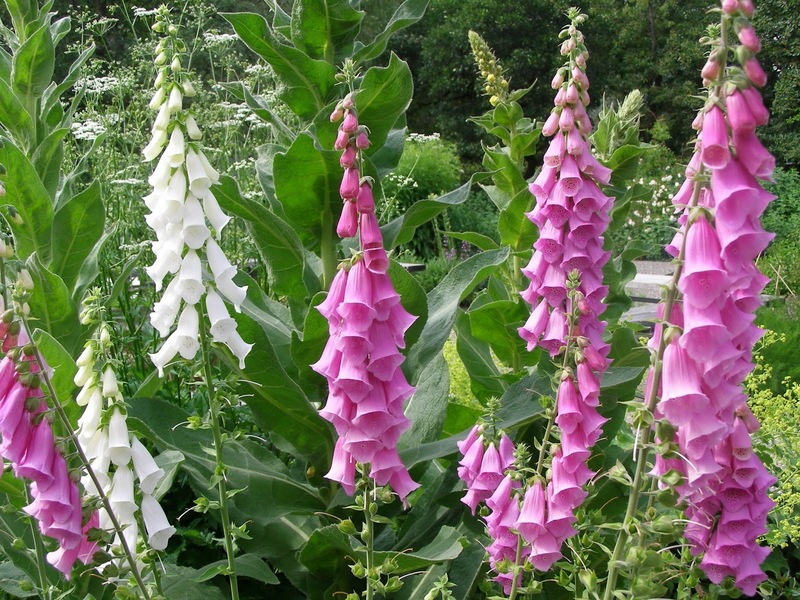 Foxglove is used for congestive heart failure (CHF) and relieving associated fluid retention (edema); irregular heartbeat, including atrial fibrillation and “flutter;” asthma; epilepsy; tuberculosis; constipation; headache; and spasm. The foxglove is also used to cause vomiting and for healing wounds and burns.